With data theft becoming common in this age of smart people and smarter phones, protecting account information, banking information, emails, and other personal information becomes all the more relevant and important. 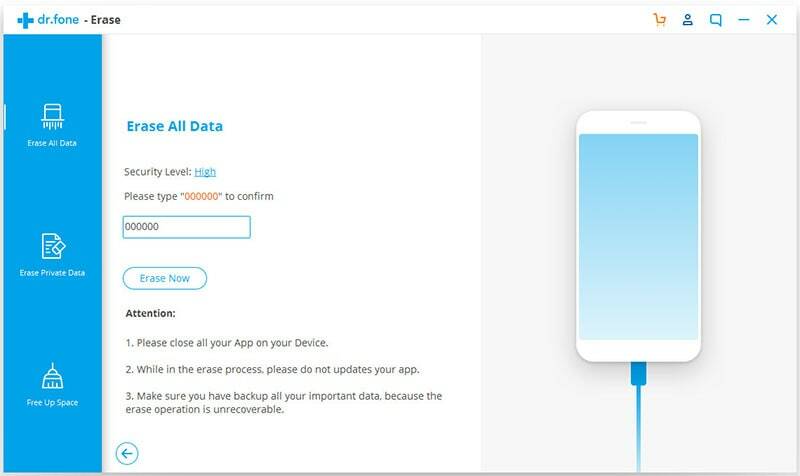 If you’re looking for a one-stop solution to erasing your phone data completely without any hassles, iSkysoft Data Eraser for Mac is the one for you! iSkysoft Data Eraser for Mac is the world’s 1st iPhone, iPod, iPad, and Android Data eraser – all-in-one! It can assist you with securely erasing messages, login info, cache, photos, videos, music, browser history and more. 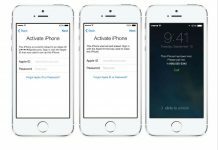 Once you wipe out your phone using iSkysoft Data Eraser for Mac, you can sell your phone with the confidence that all confidential private and personal info has been erased once and for all. With iSkysoft Data Eraser for Mac, you can have peace of mind without having to worry about all the private data on your iPhone/iPad/iPod/Android. All the data is guaranteed to be securely erased. 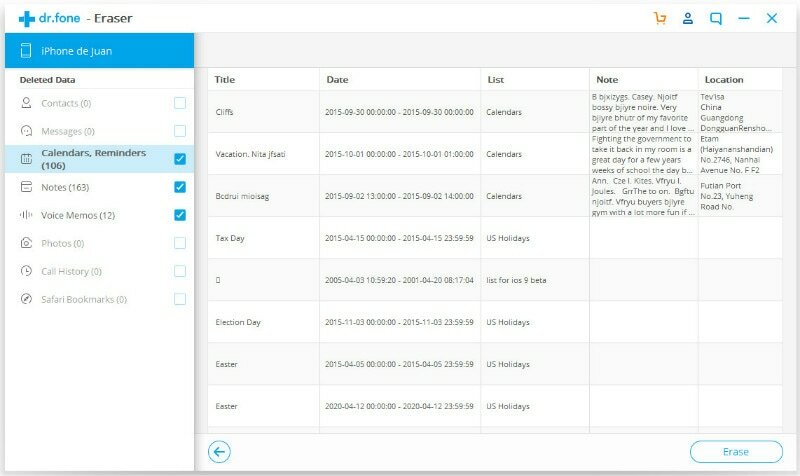 Data gets accumulated as you use your smartphones for various activities – call logs, browser history, cache data and more. 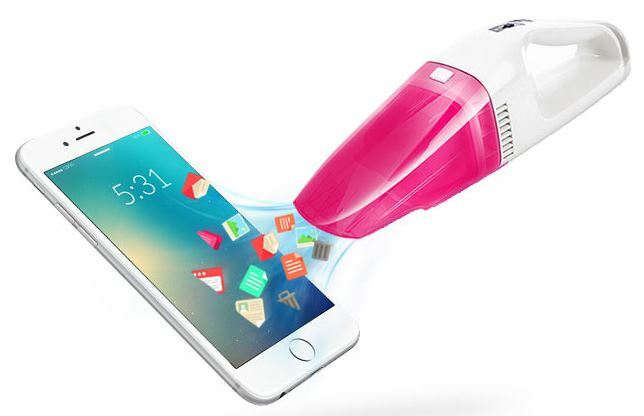 iSkysoft Data Eraser for Mac can help clean up your iPhone, iPod, iPad or Android device to free up storage and speed up your phone considerably. Sometimes, factory reset is insufficient to remove all the data on your phone. Worse, if in the wrong hands, the data can be completely recovered. With iSkysoft Data Eraser for Mac, you can be assured that the data is permanently deleted. First, download and install iSkysoft Data Eraser on your Mac, including MacBook Pro, MacBook Air, and iMac. Connect your iPhone, iPod, or iPad to your Mac with a USB cable. 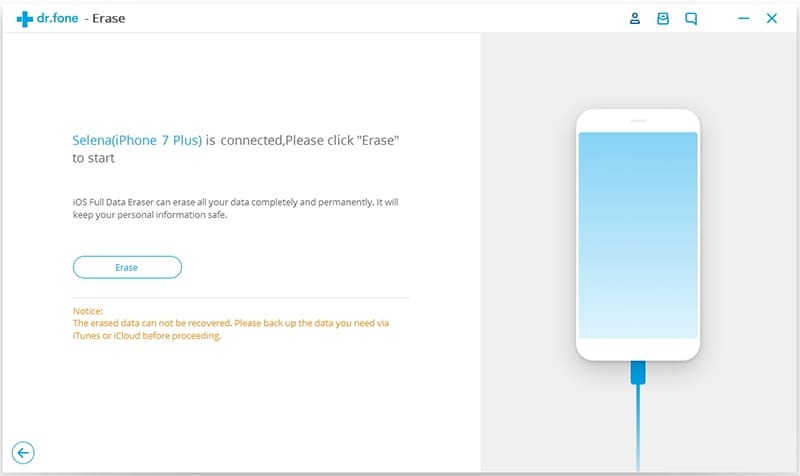 iSkysoft Data Eraser for Mac will detect your device immediately and show your device information in the main interface. 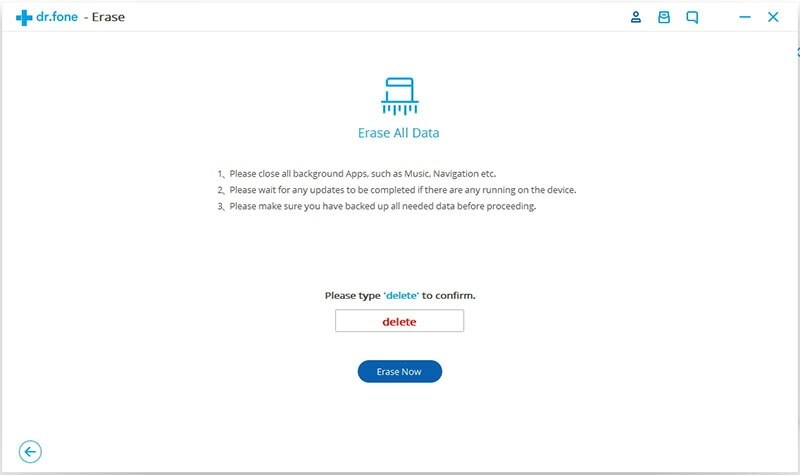 Step 1: In the main interface of the iPhone data eraser, navigate to the left column to select the “Erase Private Data” option. In the opened window, you can see the file types that can be erased. 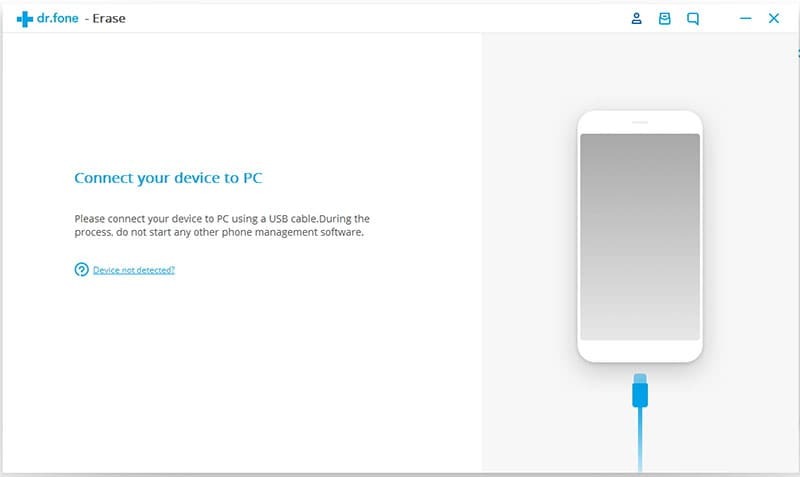 Step 2: Click “Start”, and the data eraser will start to analyze and scan your device. You can stop analyzing if needed. 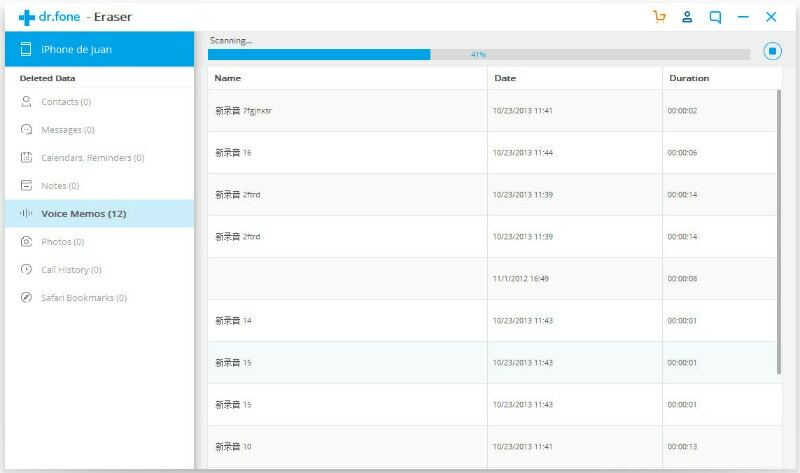 Step 3: After the scan is finished, all your device’s data will be shown in the program interface. You can click any data to view details. 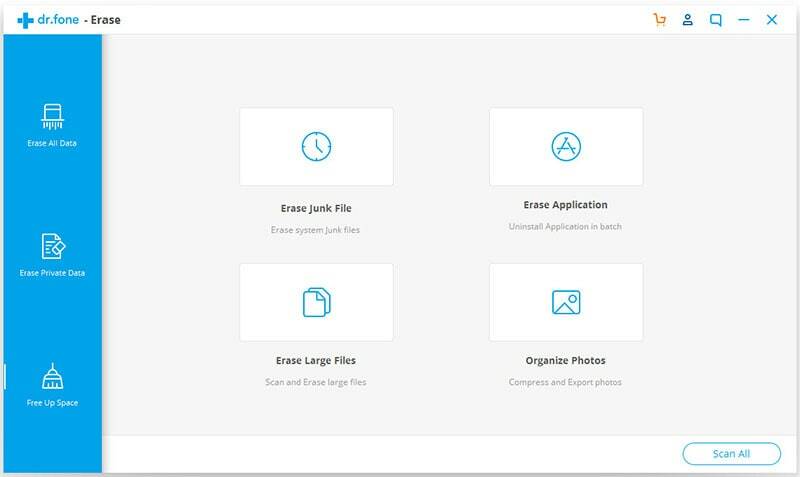 Step 4: Now check the files you want to erase, and click the “Erase Now” to delete them. In the pop-up window, type “delete” to confirm and start erasing iPhone, iPad or iPod. 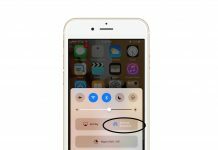 Step 1: Click “Erase Deleted Files” from the erasing options to erase any previously deleted files on your iPhone, iPod, and iPad. 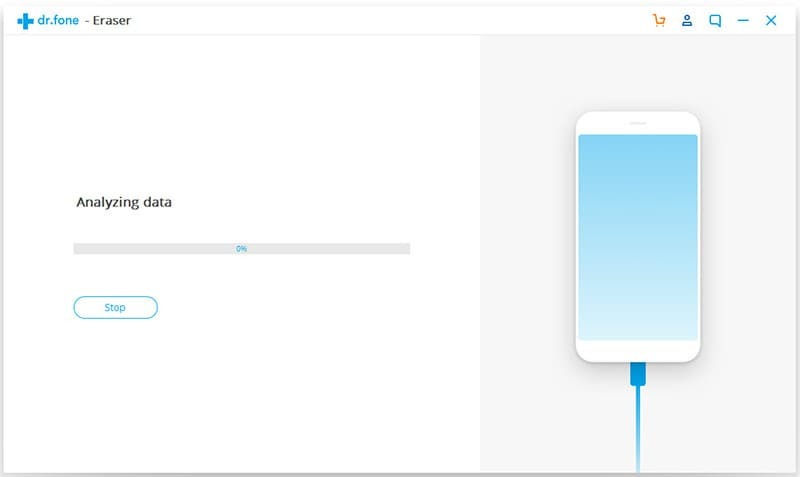 Step 2: Click the “Start” button, and the mobile data eraser will begin to scan your device. Step 3: When the scan is finished, you will see all the deleted files. You can check the files to view details. Note: iSkysoft Data Eraser for Mac will scan the deleted files and existing files, and the “Erase Deleted Files” mode will not erase your existing data. Step 4: Select the deleted file you want to erase permanently and click the “Erase Now” button. And then type “delete” when prompted in the pop-up window. The program will start deleting the file. 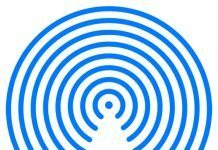 Note: This Data Eraser for Mac can detect the deleted files on your iTunes and will also erase them, ensuring the deleted files on iTunes cannot be recovered any more. Step 1: To delete everything on your iPhone, iPad or iPod, click the “Erase All Data” option. Step 2: Click “Erase Now” and type the word “delete” to confirm deletion. And then click “Erase Now” to erase all data from your device. Step 3: When the erasing is finished, you will get the confirmation window. 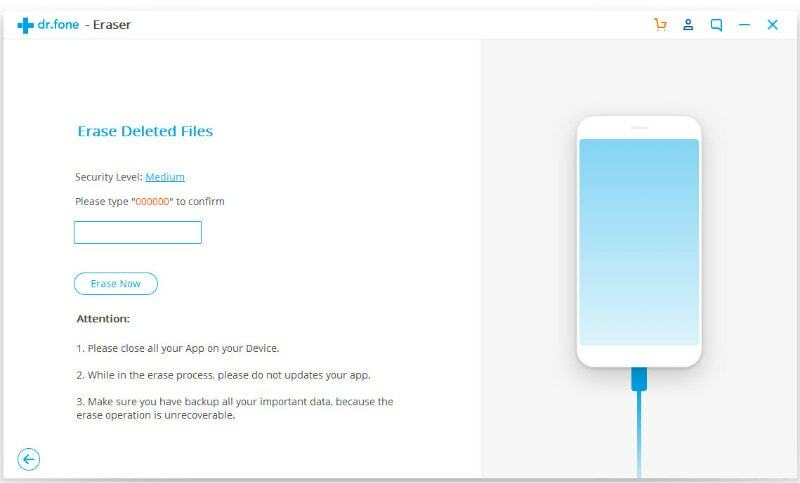 iSkysoft Data Eraser for Mac allows you to 1 click clean up junk files from your phone to save space and speed up your device. 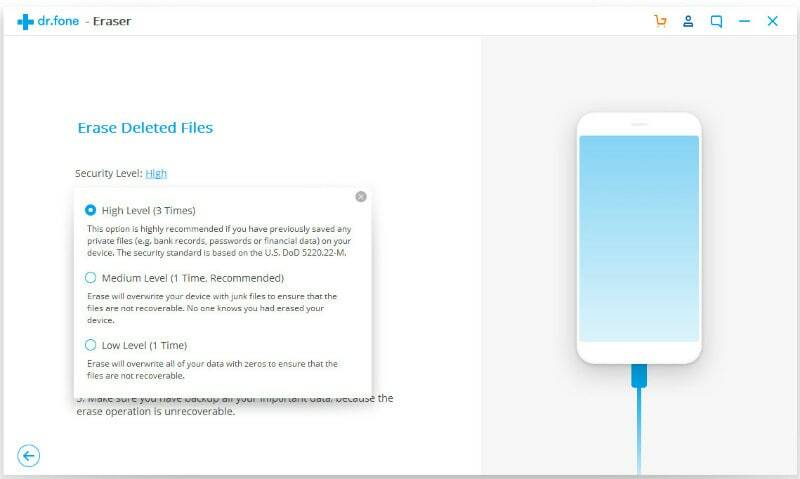 Step 1: Click the “Express Clearup” option, and you will see the space information of your device and how many days have passed since your last cleaning. 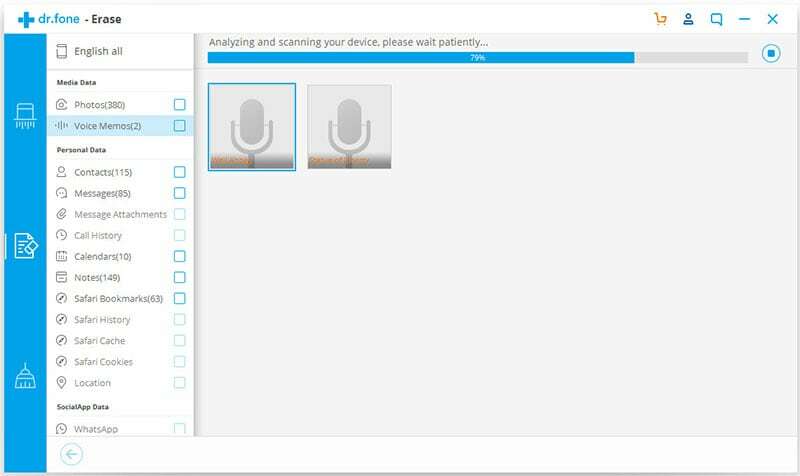 Step 2: Click “Start Scan” to scan all the junk files on your device. 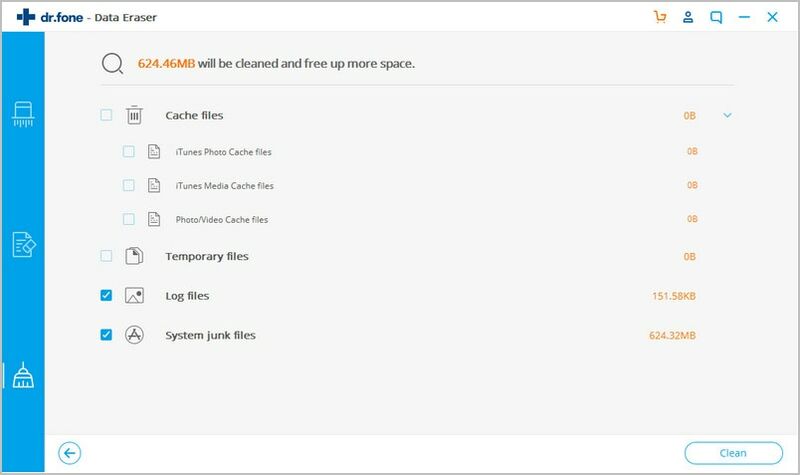 After the scan is completed, you can see all the detailed junk files that you can delete. 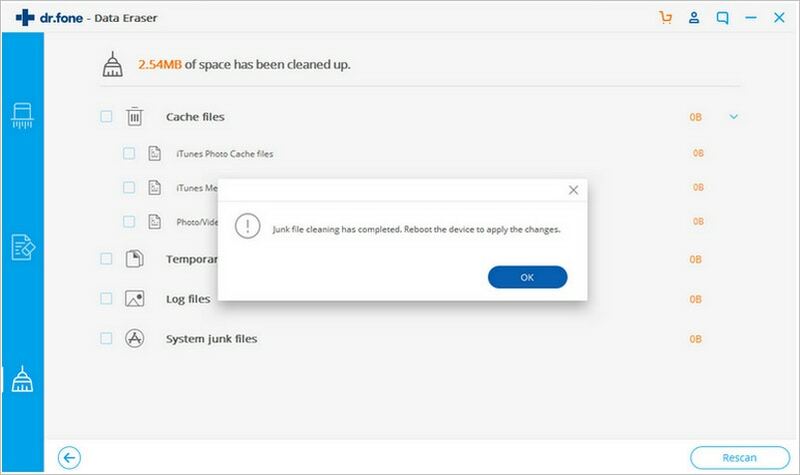 Step 3: Check the junk files you want to delete and click the “Cleanup” option to start to clean junk files from iPhone, iPod and iPad. After that, you will see how many junk files have been removed. 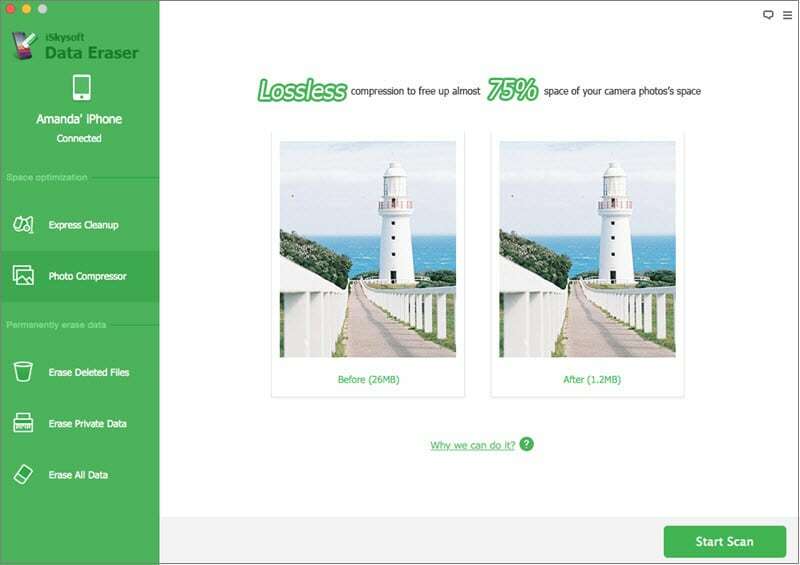 This iOS data eraser in-built a photo compressor and lets you to compress photos on your devices losslessly and backup to the computer to save more space for your device. Step 1: Click the “Photo Compressor” option to open the photo compressing window. 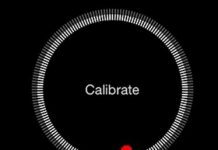 And then click “Start Scan” to let the data eraser scan large photos on your iPhone, iPad or iPod. Step 2: After scanning, you can see all the large photos on the program interface. And you can see the expected space amount it can release. Note: When the scanning is finished, you will see the “Preferences” window. And you can also see the “Photo Backup Path” tab, which is the destination to save your original photos. Before you compress your iPhone photos, iSkysoft Data Eraser will help you to backup the original photos in case you need then in future. 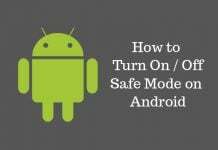 You can modify the destination and backup the photos. 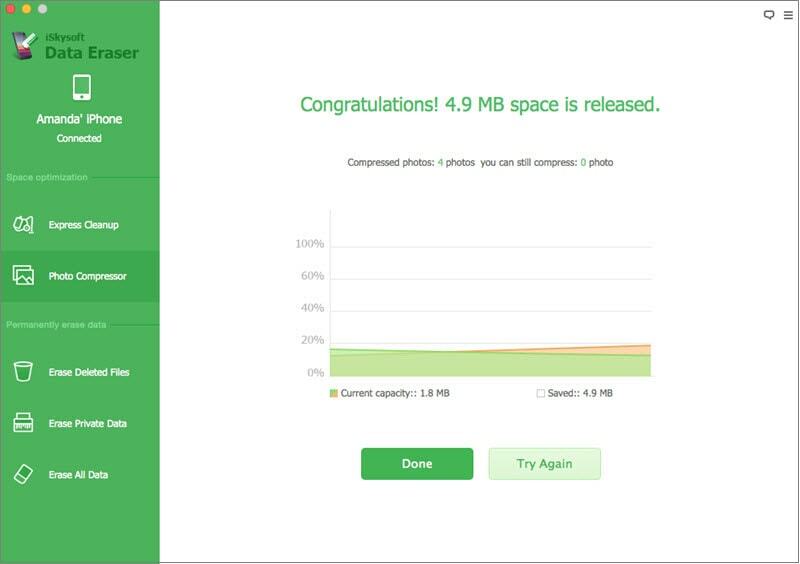 Step 3: Select the photos you want and click “Compress now” to compress the photos. In the result window, you can view the space you have saved and how much space you can use currently. Note: You do not need to worry about the quality of the compressed photos. 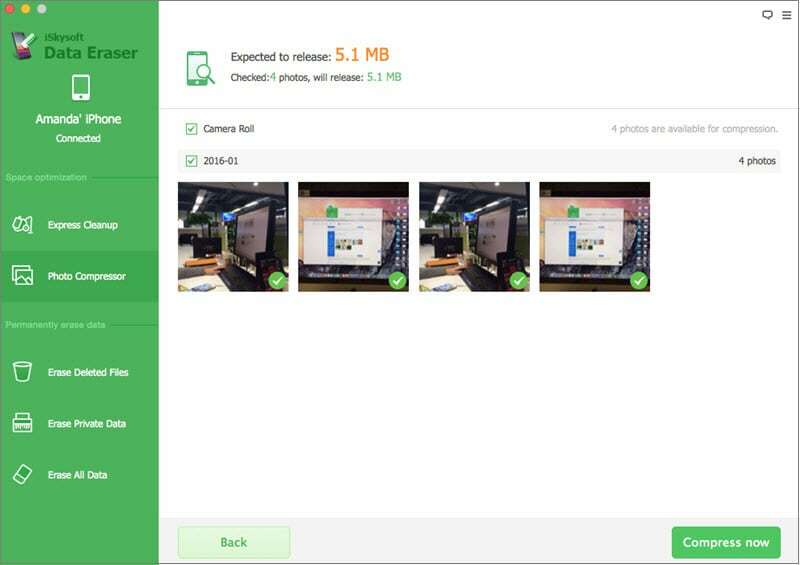 iSkysoft Data Eraser for Mac can compress iPhone photos without quality losing. That’s all folks! 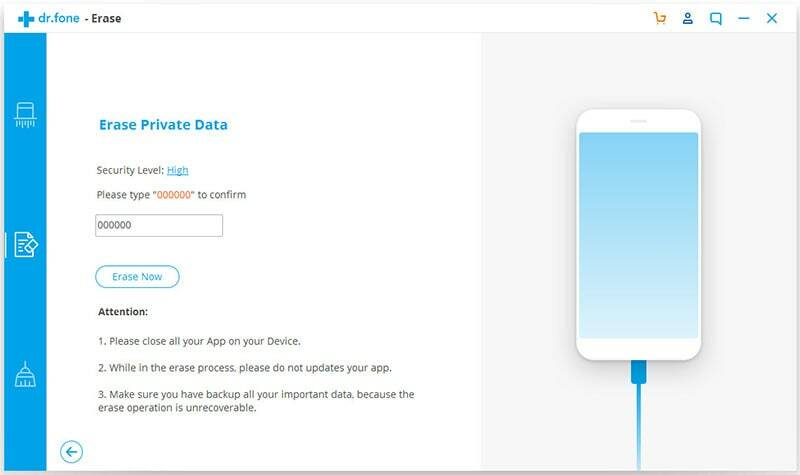 We presented a comprehensive guide on how to use iSkysoft Data Eraser for Mac to get rid of all the data on your phone securely. Use iSkysoft Data Eraser for Mac to ensure that your personal confidential information doesn’t fall into the wrong hands! Let us know your experiences with using iSkysoft Data Eraser for Mac in the comments section.